There has been a little party going on in my body this last week. I sent out invitations to germs, cramps, and even managed a special little invite to the concrete from my knee. "Come on over!" it said. "Bring a side dish effect." And wouldn't you know it, they ALL rsvp'd and showed up at the same time. Which got me thinking. NyQuil is kind of like a one night stand - irresistible in the throws of desperation, but you wake up kind of wondering what you were thinking. Advil is like the steady girlfriend - consistent, predictable, and she never lets you down. I'm just not sure which one would be more critical on a desert island, and for some reason I feel like I need to know. Care to weigh in? NyQuil, so I can sleep when I'm sick and hacking. It's a wonder drug and also kills the pain from headaches caused by hacking. That's just my take on it. Of course, if I couldn't take my RX drugs with me, I'd be dead in a week or so anyway. And I think NyQuil might remind me of my drinking days before I joined the church - only without the hangover. Advil all the way, baby. I don't think I've ever taken NyQuil in my life, but Advil and I are good friends. 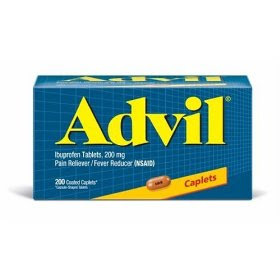 I'd be an Advil girl. It'll take the edge off of my cold even if I'm still coughing and sneezing. I say both PLUS a Tylenol PM. You'll wake up next week feeling just a teensy bit groggy but all better. 100% of me votes for Advil. Can't even stand to THINK about any type of cough medicine. I'd almost rather die coughing than take that stuff. Advil and I have a regular relationship. We usually catch up over a terrible headache. Absolutely Advil. It's your friend for all sorts of occasions. You know, the friend through all of life's trials. No question...Advil. I don't know how I would survive without it, and if you take enough, you can't feel the pain of the cough! That's tough. I'll go with the nyquil. How about Swine "Thera-Flu"? Might be more appropriate for the times we are living in! Well, I just thought you had your kids really, really young. I've found that Advil in the REALLY big bottles makes a nice little gift to myself. I honestly can't decide. They both have such special, sacred places in my life. It's like asking me which of my kids I love more. Actually, no. It's harder than that. Can it be Advil cold and Sinus? Cuz I would totally pick that one! You looked great at church you sassy little thing! I take it your feeling better! Advil, Advil, Advil baby. Works on everything. Okay Vern. It's taken me a frieking week to figure out who YOU are. Just so it's out there...you will NEVER be known as your real name in my book again. Vern it is. Also, I'm not sure why this hasn't been mentioned yet...but I'm pretty sure I'd take me along a nice bottle of percocet or maybe some crack...is that an option because really, how long am I stuck on this island? You are hilarious! My opinion is that if you're are on a deserted island and you're all alone, you might need something a little stronger! Like, something with a small dose of anti depressant on the side to keep you from losing your mind! 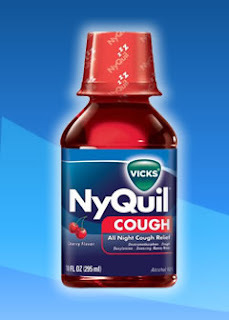 But, NyQuil would be my choice between the two, cuz if you were desperate to sleep...take a swig! Nyquil hands down. It cures everything including pain (painkiller included in the sniffling, sneezing, coughing, aching, stuffy-head, fever, so you can rest medicine). And I'm pretty sure if I was on a desert island I wouldn't care if I slept 22 hours a day. At least then I'd be able to dream there was a hot cabana boy bringing me my diet coke.